Have you ever dreamed of someone who has died and wondered whether they are actually communicating with you? These are something special that I call visitation dreams, and I've experienced them my whole life since I was a very young girl. Today I thought I would explain these types of dreams and help you understand them better. I also want to assure you that you are NOT crazy if you find yourself talking to dead people in your dreams. It is perfectly normal, but it's not something most people share or talk about that often. So, if you're looking for help in understanding dreams about a passed on friend or family member or other loved one, today I hope that my 30+ years of experiences will help you understand what's going on. 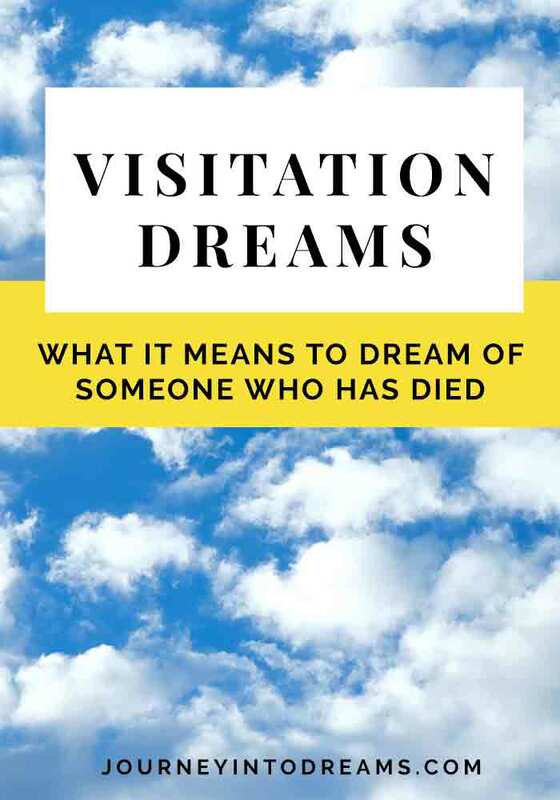 First: What is a Visitation Dream? A visitation dream is best described as a dream experience where you truly do feel as if you have communicated with a deceased loved one. Typically these are passed on friends and family members who you were close with - but it can also even be acquaintances or even non-human loved ones, such as a pet dog or cat! There are many different reasons why we may dream of someone who has passed away. Sometimes, our dreams are release dreams, where we are simply just processing our own feelings of grief or sadness when we lose a loved one. Those types of dreams are release dreams, which are different from true visitation dreams. In a release dream, you are often processing your own feelings and emotions. Some of these dreams can be quite confusing! Sometimes they can even be scary in some ways, especially if the feelings you are releasing and working with are ones of fear, worry, or sadness. Many of us will experience both visitation dreams and release dreams at some point in our lives, and both are completely normal. While the Visitation ones aren't ones we talk about very often, they usually are the ones that leave a lasting impression and memory in our lives. There are many different types of dreams, and one of the most common types of dreams is a release dream. Release dreams often help us process and understand the different feelings and emotions we are currently dealing with in life, or they can help us to let go of past feelings we may be holding onto. Many times, dreaming of a person who has passed on can simply be a release dream in which your feelings about the person come to your conscious awareness. You may have a dream about a person as a natural part of dealing with the emotions involved when you are experiencing grief. The dream may also be one in which you are simply remembering the good things about a person, or our subconscious way of expressing our love/sorrow for a person. Sometimes in our dreams, the people who show up in a dream are like characters of a movie. They are not there as true manifestations of the person, but instead as a symbol or sign for something else in life. I have had many different visitation dreams in my life, and yes, I do believe they are real. However, there have also been times when I have dreamed about passed on relatives when they were NOT visitation dreams. In every visitation dream, there have always been some very clear characteristics of the dream for me to know it was truly a visitation dream and not just a release dream. In order to make sense of your dreams and to know whether or not you truly are communicating with a passed on family member, it is very helpful to know the characteristics of visitation dreams. One of the best ways to understand a visitation dream is to show some examples. My first visitation dream was when I was six or seven years old. I don't really remember all the details of the dreams (it has been over two decades since the dream now!) - but I do remember my grandmother coming to me, telling me she loved me, and saying Good-bye. She didn't actually say the words good-bye, but I knew in the dream that was why she was there. I woke up, knowing she was gone. Sure enough a few minutes later my mother called the house to let us know what I already knew from my dream. Visitation dreams are very common in these instances. Often times our loved ones wish to say good-bye to us before they cross over into the spirit realms. Another visitation dream happened when I was 12 and involves my other grandmother, who called me on the telephone. In the dream, she left a message on the answering machine in the dream (yes, we still had answering machines back then!). She was very clearly leaving me a message! Since then, I have noticed the telephone has been a very popular dream symbol for spirits trying to communicate, especially passed on loved ones. I've had many dreams of phone conversations with my passed on family members and friends! More recently, I had an interesting visitation dream with one of my aunts who passed away. We were sitting at a kitchen table, and she looked good - much younger, vibrant and healthy - how I remembered her when I was a young child. We had an interesting conversation, where she explained how her physical body was just too tired to keep going in this world. We talked about the day she died and how sad it was for her to leave her kids and grandchildren behind. Our family had been through a lot of losses, and so she mentioned feeling sad that she was also leaving my dad and the other siblings behind. However, she told me that she knew her body would not keep up. She was trying to do a lot more in the physical world than that tired old body could handle. She could do a lot more by watching over for her loved ones "on the other side" so to speak. Of course, she then laughed and said, now don't give anybody any ideas - nobody better be doing anything dangerous or dying anytime soon! We don't need any extra work around here! In the examples of these dreams I have shared, you will notice that some of these have very distinct characteristics. Understanding the common signs of a visitation dream will help you better be able to identify whether you are truly communicating with the spirit of a passed on family member or whether your dream may simply be a release dream of processing thoughts and emotions. The next question that most people have about a visitation dream is wondering how they might be able to have one, or if it requires some sort of special psychic gift or ability. The good news is, anyone can have a visitation dream - you do not necessarily need to have a natural ability to communicate with spirits. While it can be helpful to practice your intuitive abilities, it is not required by any means. If you are wondering how to have a visitation dream, there are some things you can do to help open yourself up to communicating with a loved one who has passed away. This is called "programming your dreams" and it is a good habit to do at night anyways, even when you are not looking to have a visitation dream. Meditation can greatly help you with calming your body and soul to help you be more open to receiving your dreams. Guided meditation can help you get started with meditation if you have never tried it before. You can also just try some deep breathing exercises which will help relax your body and your mind. Sometimes you need to say affirmations that you want to see the person. This is because subconsciously you may be unsure or afraid of having such as dream. Say to yourself, "I am open to dreaming about [insert person here] and would like to receive a message from them" or another similar affirmation. It may take several attempts, but after several nights or weeks, this will increase your likelihood of dreaming about the person. Getting in the habit of remembering and writing down your dreams will help you better understand the world of dreams. Keeping a dream journal is always a good idea - even if you do not always want to know the deeper meaning of dreams. The simple of act of writing things down will make it easier for you to remember dreams and process any emotions and feelings you might have. It can also help you clear through any other "energetic gunk" such as feelings of sadness or fear that might be standing in the way between you and a loved one trying to communicate with you. Of course, it's important for us to cover that not all deceased family members or friends will appear in a dream. There are a lot of possible reasons for this - and it's not because there is anything "wrong" with you! One of the things that is important to remember is our passed on loved ones have their own spiritual needs and goals. Some people who have died are not able to communicate through dreams - it's simply not a skill they have. It may not even be something they would have a conscious awareness of being possible - even when they are a spirit. Others simply may not want to. Free will is not something that we only have on earth - it is something that we have as a universal law in any type of manifestation of conscious. If someone you cared about deeply has passed on and you have not had a visitation dream, it's possible that the person has already crossed over very quickly and is absolutely "done" with the physical world in which we live. They are very likely already onto the next part of their own spiritual development journey. This does not mean that they are "too busy" for you - but it may not have any true benefit to them or you to communicate with you. Sometimes those who have passed on are simply done with this life and this world - and so in that reasoning, it does not make any logical sense for them to come back. There are also a lot of other variable factors that can affect whether or not the spirit of a deceased loved one might not be present. If you need to heal from a traumatic experience or are in need to move into the present moment and your current life, it may be that the communication from the person would not help you do these things. It is not always beneficial for you to communicate with a passed on loved one - sometimes this is simply a clear sign that it is time to move forward and begin to heal from feelings of grief or loss. Lastly, it's important to know that our passed on family or friends are not always necessarily good for giving us guidance! Just because someone is in spirit form does not automatically make them a spirit guide or enlightened being! Just like those of us who are in the physical world, there are many spirits who are still in their own phases of development of consciousness. Update August 2018: This article originally appeared in 2012 on our old site before we updated our website to JourneyIntoDreams. This was one of the first and original articles to appear on the internet about visitation dreams. Since the date of original publishing, we have received thousands of comments and messages from others who have shared their experiences about visitation dreams. We have imported the majority of these original comments from the old website because it can truly be uplifting to read through these and certainly validates that the experiences of a visitation dream are real. Please take a moment to read through the comments on this article, because it can truly be quite interesting to read! And, if you would like to share your experiences or dreams, we would of course love to hear from you in the comments! Have you had a visitation dream? What was your experience? Share your thoughts in the comments section below! I dreamed that I layed in my bed watching TV with my dead father.We held hands in a very natural and comfortable way. He told me he had to leave soon because his boyfriend was waiting for him. But he wasn’t gay, I am. He died before I came out of the closet.I think wanted give his approval. i have many vivid dreams and sometimes i have dreams that will happen after a month or a week.some call it deja vu. every time i dream my brother(he died 14 years ago) something bad happens.its like he is warning me through my dreams.i know it sounds weird but it is true.and once i was soooooo upset and crying and i felt like a warm hand on my back and suddely i felt good ,i just stopped crying and i knew everything was going to be ok and it was.i just couldnt believe. If have dreamt of my long passed grandfather,I speak to him only and ask him how is it possible you are here and he has just smiled, never spoken out to me. Is this some kind of message? I have had loads of dream visitations and they are doubt one of the most strangest and surreal experiences I have ever had. Every time I think about my experiences I get a warm glow and a feeling of awe. My Mother passed away suddenly, two months ago. I had my first dream about her a few nights ago. I’m not sure if it was a “visitation dream” however, in my dream, my Mother was alive and sitting in a chair (in the hospital, where she died), and I saw her hand and I held her hand. I was relieved to know she was “alive”. The dream seemed very “vivid” to me, as I remember every detail. Was this a “visitation” dream? Was she letting me know that she is okay? I would agree. The link you posted to that door was historic house parts! Sounds like a big message to me. My mother passed 9 months ago. I am sharing with my dad and siblings the dreams we have had of her. This article hits on all the points. It’s amazing. I haven’t heard from her in a few months. Thanks for sharing about the meditation and such. I am going to try that! i had a dream of my grand parents, who are dead ryt now. In that dream i was crying to meet them and was asking god to please help me in meeting my grandparents. After a while the visited me n we realy enjoyed. From what I have researched and read, it is not easy for spirits to visit us, even in our dreams, so I am always thankful when I do have a visitation dream!